Learn about Jonathan J. Creech, O.D. Dr. Jonathan Creech is the youngest of the five children born to James and Kimberly Creech. Dr. Jonathan was born and raised in Southern California and has been living in the Inland Empire for the past 13 years. For his undergraduate education, Dr. Jonathan attended Westmont College in Santa Barbara, California, where he received his bachelor’s degree in biology with a minor in chemistry. He then attended Western University of Health Sciences College of Optometry where he graduated with honors receiving his Doctor of Optometry degree. 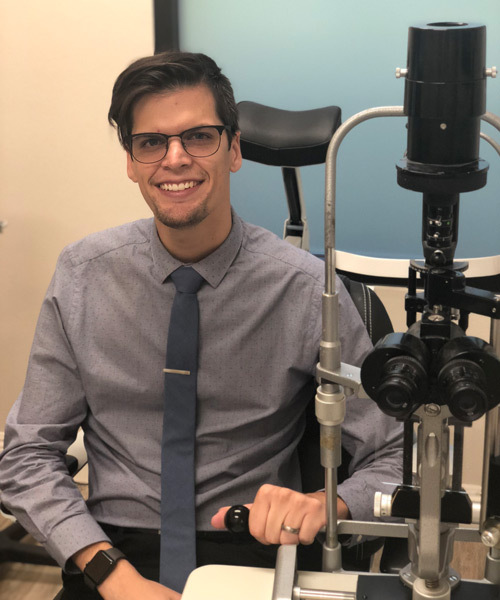 During his time in optometry school, Dr. Jonathan chose to travel across the country to work with some of the most skilled retinal specialists, corneal specialists, and ocular surgeons to better serve his patient’s ocular needs. Dr. Jonathan is married to his beautiful wife, Brooke. They are waiting to have children until Brooke graduates from veterinary school in the summer of 2018. Although they do not have kids of their own, Dr. Jonathan and Brooke have 12 wonderful nieces and nephews. They also have 4 cats, a dog, 4 rats, a snake, 2 guinea pigs, and a bird. Aside from taking care of their animals, Dr. Jonathan enjoys sports, both playing and watching, and is an avid Laker fan. He also enjoys playing video games, watching Netflix, and adventuring with Brooke. Learn about James E. Creech, O.D. Dr. James Creech was born in Minneapolis, Minnesota, but at the age of 18 months moved to the Southern California region. 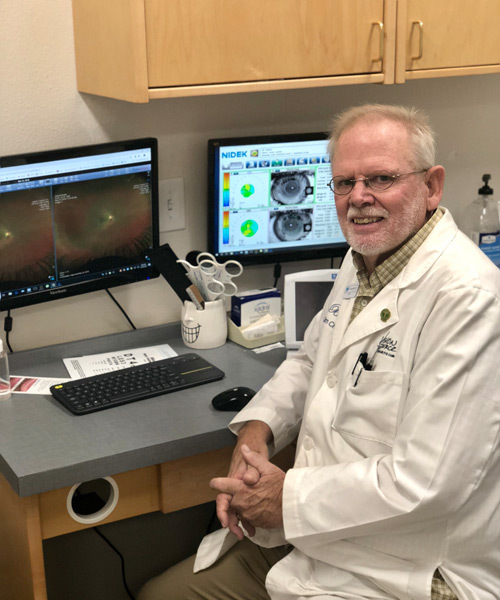 Although he was not born here, Dr. Creech does consider himself a native Southern Californian and the only other place he would consider living is in Hawaii. For his education, Dr. Creech attended the University of California Santa Barbara where he studied aquatic biology. He then attended Pacific University College of Optometry in Oregon where he received his Doctor of Optometry degree. He has since received further training in treating eye diseases from UC Berkeley, UCLA, and the Pennsylvania College of Optometry. Dr. Creech has practiced in many clinical settings including the United States Navy, large clinical and surgical practices, and private practice. He especially enjoys meeting the visual needs of children and seniors. Dr. Creech has been married to Kimberly for 46 years, and has five children, 12 grandchildren, 2 dogs, 22 koi fish, 1 cat, and 4 chickens. He enjoys building, the outdoors, disc golf, and being actively engaged in his Christian faith..